John’s fascination with martial arts goes all the way back to his childhood. He started his martial art training in Judo at the age of 12, and this kept him learning for many years. 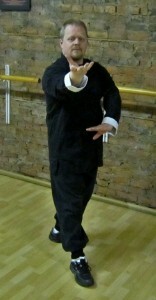 In 1992 he moved to Hamilton and continued his explorations by entering training in Wing Chun Kung Fu. It was there that he encountered the world of the ‘internal” styles of martial arts and a few years later started learning more about Xing Yi, I Chuan and Baguazhang. Yet there was always something missing. After several years of training and researching the varying styles of internal arts, he found it was Baguazhang that most captivated his interest. In 2004 he happened upon a Nine Dragon Baguazhang workshop hosted by the Toronto school. They brought the head teacher of that system, Dr. John P. Painter to share some of his knowledge of the art. It was there, Mr. Trumbell found what he was missing. A complete internal martial that included real self-defense, philosophy, health and spiritual practice. In particular it was the use of the mind to activate one’s neural response system that captivated him. Today John teaches classes in the Hamilton Ontario Nine Dragon Baguazhang School. He is a certified instructor and loves to share this life affirming art to all. In his quest to learn this art he has also received instruction in weapons training, Iron Palm and Qi Gong. Sky Dragon Centre, 27 King William St.
Get emails from our home base, The Gompa in Arlington, TX!